The skin is a mirror that reflects everything going on behind the scenes, inside our bodies. And so the same foods that have us feeling a decade older make us look it as well. What if the key to slowing the signs of aging isn’t in some fancy new French serum or laser treatment but on your dinner plate? Well it’s high time we learn that beauty is not only skin deep: the skin is a mirror that reflects everything going on behind the scenes, inside our bodies. And those foods that have us feeling a decade older make us look it as well. Because aging is characterized by chronic, low-grade inflammation. In fact, the connection between inflammation and aging is so strong that the duo has even earned itself a celebrity couple nickname à la Kimye: “inflammaging.” And some foods accelerate this process by adding fuel to the inflammation fire. In the body, chronic inflammation translates to aches and pains as well as an increased risk for age-related diseases such as atherosclerosis, Alzheimer’s, and type II diabetes (source). In the skin, inflammation induces oxidative stress, reducing cells’ ability to defend themselves from free radical damage and promoting collagen breakdown. Wrinkles, loss of elasticity, and skin sagging result. So while there’s no stopping the aging process, you can take steps to slow it… and it’s as simple as kicking a few key pro-inflammatory foods off of your dinner plate! Although insulin is natural and very necessary, high levels – which we experience after eating a sugary food or carbohydrate-rich meal – are extremely inflammatory.Elevated blood sugar levels also accelerate a natural process called glycation, in which glucose attaches to proteins in the body and makes them rigid. This includes collagen and elastin, proteins that keep the skin smooth, elastic, and tight. These rigid proteins are called advanced glycation end products, or AGEs for short. This acronym couldn’t be more appropriate: not only do AGEs trigger an inflammatory reaction, but they also cause collagen and elastin to become brittle and break, promoting skin aging. Even more concerning: AGEs are behind a number of age-related degenerative diseases, such as atherosclerosis, macular degeneration, and Alzheimer’s. The blood sugar highs and lows we experience from a sugary treat or carb-heavy meal also zap us of our energy. And certainly nothing makes us feel a decade older than lacking the energy to get through the day let alone a 2:00 meeting! SOLUTION: No, you don’t need to cut out all sugars and carbs from your diet forever and ever! To help keep blood sugar levels steady, it’s best to minimize table sugar and sugary treats, and balance healthy carbs with protein and healthy fat, which slow glucose absorption into the bloodstream. Not only are these oils are some of the most unnatural, processed foods on the market, but they’re also loaded with polyunsaturated omega-6 essential fatty acids, which kick-start the inflammatory process. And while omega-3 essential fatty acids signal the chemical messengers that turn off the inflammatory process, the average person consumes 10 to 15 times more omega-6s than omega-3s. Since we ought to be consuming the two in about equal quantities, our bodies are perfectly able to inflame without being able to properly anti-inflame. It’s the perfect recipe for chronic inflammation and inflammaging of both the skin and body. SOLUTION: We need to increase our omega-3 essential fatty acid intake and reduce omega-6 essential fatty acids in the diet. Wild-caught, cold-water fish like salmon, sardines, and anchovies are the richest dietary sources of omega-3s. And keep a close eye on ingredient labels – vegetable oils are a main feature in processed foods, from mayonnaise to crackers. Really, this is yet another reason to give processed foods the boot! AGEs aren’t just a result of elevated blood sugar levels – they’re also found in burnt and charred foods. These dietary AGEs are likewise pro-inflammatory (source). On the day to day, the best cooking options to minimize dietary AGEs are boiling, steaming, slow-cooking, low- to medium-heat baking, and medium-heat panfrying. SOLUTION: Limit burnt and charred foods. As simple as that! Gluten is a composite of the proteins glutenin and gliadin, the latter of has been shown to cause intestinal permeability or “leaky gut” (source). By allowing toxins and undigested food particles to pass through the intestinal lining, leaky gut prompts an immune response and is a significant cause of chronic inflammation. Amylase trypsin inhibitors (ATIs) found in wheat have also been shown to provoke an inflammatory immune response in the GI tract (source). SOLUTION: Instead, opt for gluten-free grains like quinoa, buckwheat, oats, amaranth, and rice. These high-glycemic, simple carbohydrates might as well be table sugar to your body since they’re so quickly converted to glucose once digested. In fact, a single serving of “healthy whole grain” breakfast cereal can have a glycemic index higher than pure table sugar! As a result, these refined grains similarly cause a dramatic, pro-inflammatory insulin spike. The fiber in unrefined grains, on the other hand, help to slow glucose absorption into the bloodstream and so are a better option. SOLUTION: Opt for gluten-free grains in their whole form — again, quinoa, buckwheat, oats, amaranth, and rice — and limit processed foods as much as possible. It’s estimated that 75% of the adult population can’t properly digest dairy. Since improper digestion and food intolerances are a major source of chronic inflammation, for a large majority of the population, dairy wreaks havoc on the body from the digestive system to the skin and is best to be removed. Conventional dairy also (very sadly thanks to modern “factory farming”) contains unnatural hormones and antibiotics. And all dairy (but particularly low- and non-fat dairy since they don’t have the fats for balance) spikes insulin levels, setting off the aging blood sugar roller coaster. SOLUTION: If you’re among the minority that can tolerate dairy, choose organic, full-fat options. And for many, goat’s milk dairy is often better tolerated, so go ahead and grab the goat cheese! 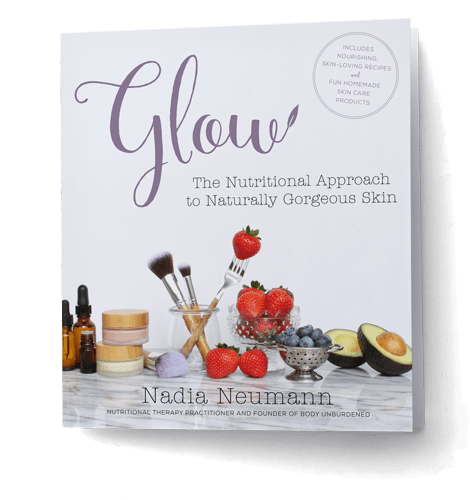 Your body will reward you for removing these foods from your diet – with youthful, glowing skin and the vitality to match! 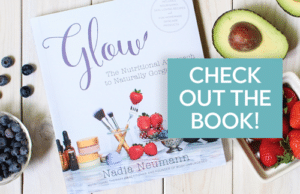 I love learning how food is so interconnected within our body’s system and how it can really impact the way we feel. I like your ideas to replace these foods — it’s nice to have a way to make a positive change, not just remove something we’re used to. Also, I just added you to my green blogger round up post this week. I just love reading your posts and information! Thank you so much for getting this info out there! Hey, Amanda! Oh thank you so much for including me in your roundup – I really appreciate that! And yes, all about those simple swaps! Healthier choices don’t need to be totally drastic or feel like a huge chore. I am wondering about safflower oil -is it also included in the vegetable oil category and should be avoided?